MMO-C and the wowhead WoD beta site both have up the datamined info for the latest alpha build for Warlords of Draenor, and hunters woke up with some amazing news! First off, Distracting Shot. It's back, with a vengeance. Thank the old gods. This is one of my favorite abilities for the more extreme end of soloing, and I'm incredibly grateful to see it return. Not to be too cocky, but I think we all know this is why they brought it back. Edit: And now we have confirmation. @DeliriumHunts Confirmed. We were touched. The big news, however, was the level 100 talent replacement for the nixed flaming shots. Ladies and gentlemen, we've got Exotic Munitions. Equip your autoshot with a 20% additional Fire damage to all targets within 8 yards, a 200% AP nature damage DoT, or a 40% frost buff, which reduces target's movement speed by 50%!!!!! We asked for something more interesting than the flaming shot talent, and did blizzard ever deliver. This is going to make the choice between the level 100 talents incredibly hard. Also tucked in there was some damage reductions to some of our shots. The big one that jumped out at me was Multi-shot damage was cut in half. I'll work on the math at another time, to double check myself, but it sounds like this is going to make Lone Wolf a much less viable AoE spec for MM (with serpent spread it should still be a good buff for SV AoE). Bendak has a summary of all the hunter specific changes over at the Eyes of the Beast. 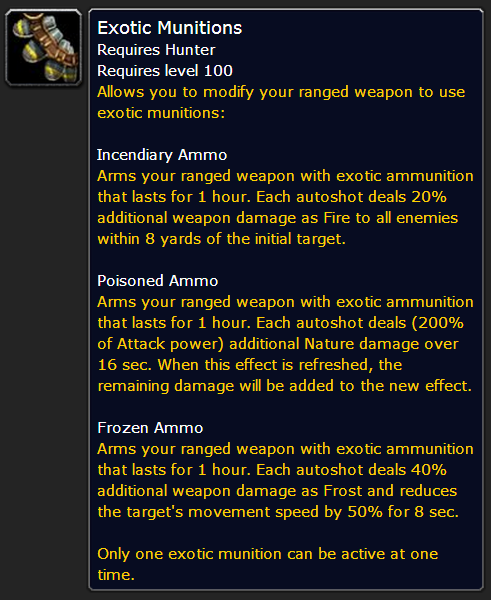 And you can look at wowhead's highlights of the new build here.